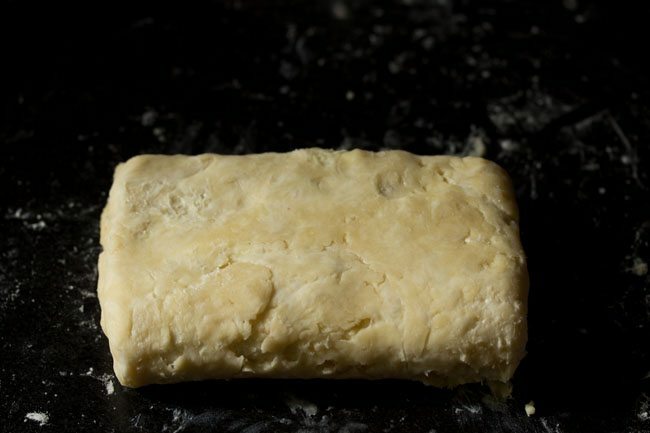 rough puff pastry recipe - a simple, quick and easy puff pastry recipe. 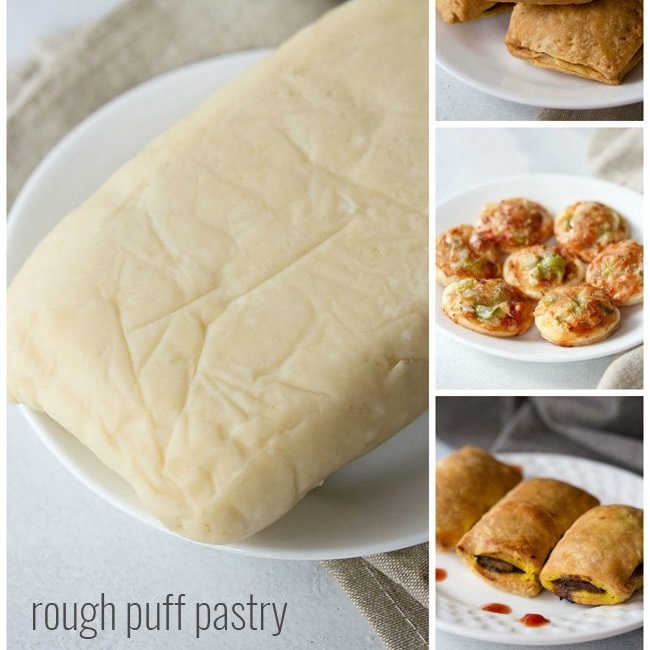 rough puff pastry recipe with step by step photos – a simple, easy and quick rough puff pastry recipe that cannot go wrong. i had got a lot of requests for puff pastry recipe. i tried the conventional method many times but, something or the other would go wrong. moreover the conventional way of making puff pastry takes a lot of time. i wanted to share an easy recipe with the readers, so that they can also easily make puff pastry in the comforts of their home. 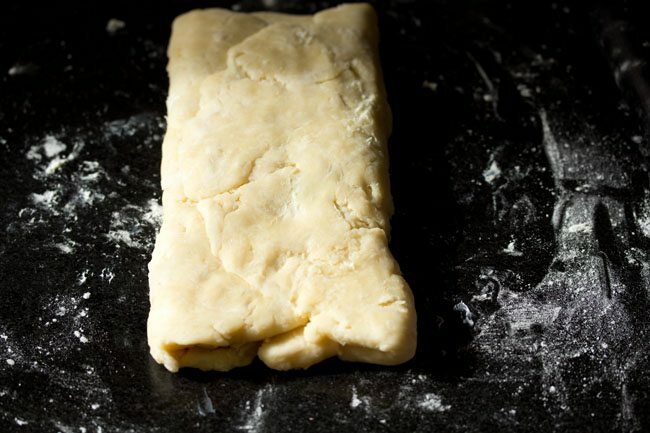 this rough puff pastry recipe is fool proof recipe, if you follow the instructions correctly. i have adapted this recipe from the book – “the baker’s manual” by Joseph Amendola and Nicole Rees. made some changes to the original recipe. the result were baked puffs with crisp, flaky texture. though rough puff pastry dough does not rise as much as the traditional ones, but good enough. 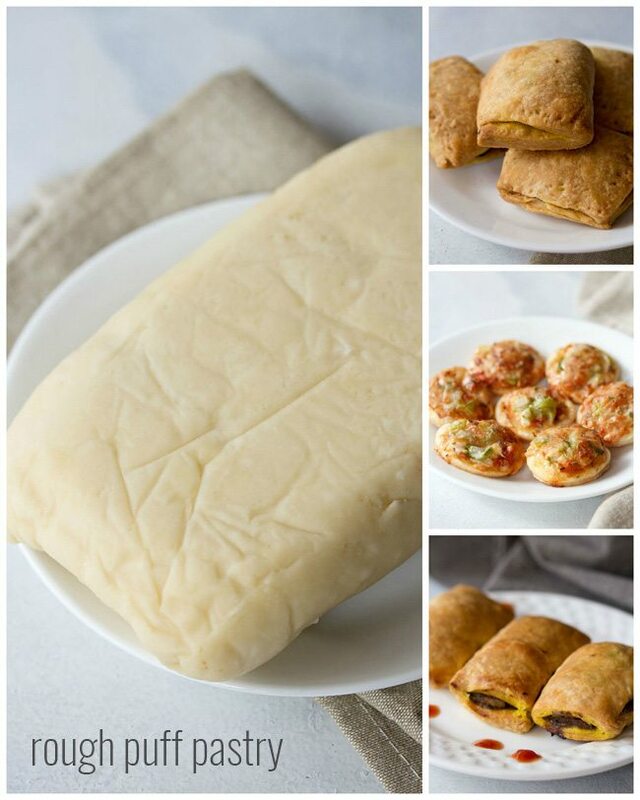 i made veg puff, pizza puff and mushroom puff with this pastry recipe. 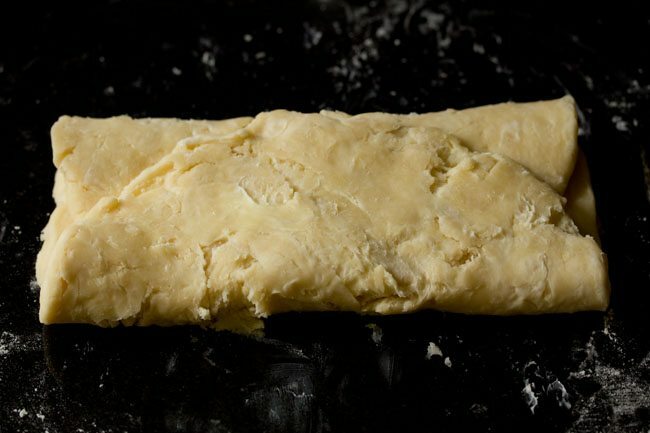 for making the rough puff pastry, you need cold unsalted butter, all purpose flour (maida) and salt. for butter, you can use salted butter. but then do skip adding salt in the recipe. 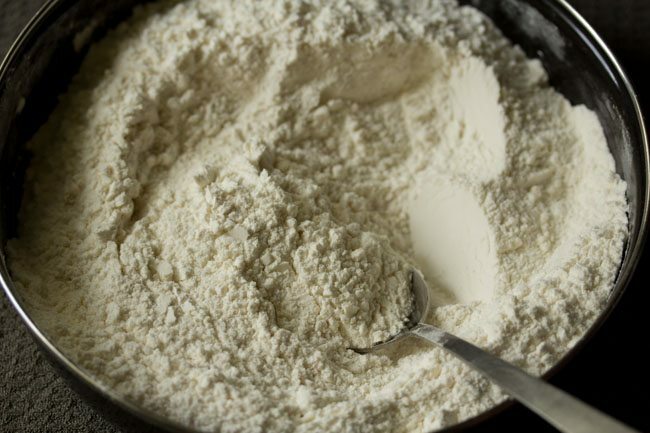 for all purpose flour, you can use a good quality flour. i suggest to use organic flour. for all the bakes and recipes i make with all purpose flour, i use the organic one. 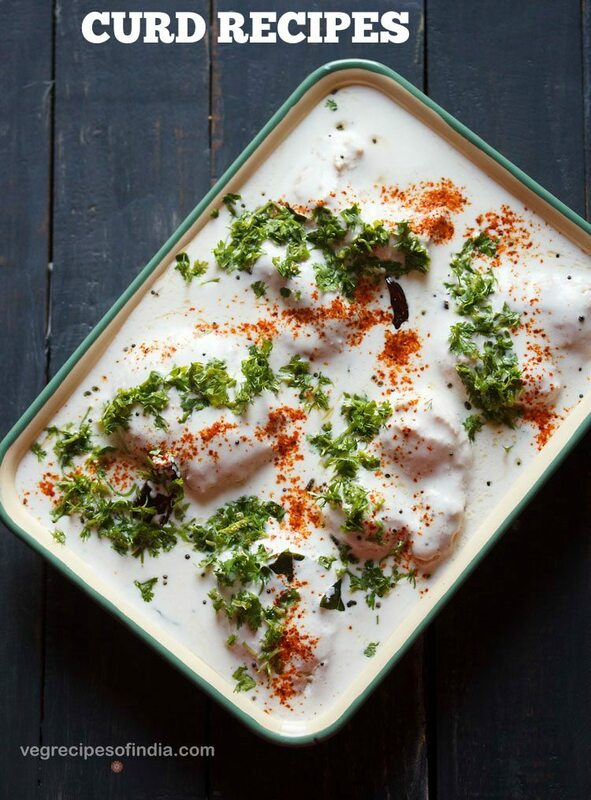 the recipe is simple and you just need to get the techniques right. in one hour the rough puff pastry will be ready. 4 to 5 minutes mixing in the initial round and then later 10 to 12 minutes while rolling the puff pastry. 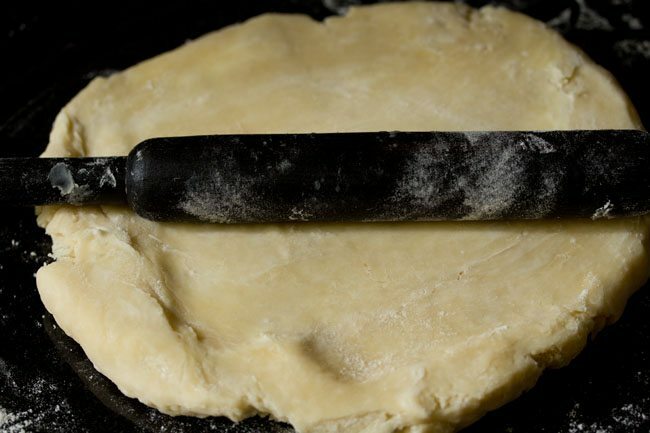 in between these two major steps, you do need to refrigerate the rolled pastry sheet for about 45 minutes. easy. isn’t it? while making rough puff pastries, you do need to keep a check on the temperature in your city. avoid preparing in hot and humid indian summers. the puff pastries can be a disaster, if not handled well. the butter melts and all you get is a dense dough like pastry. the kitchen should not be hot and humid. i have mentioned tips and pointers wherever possible in the step by step pics. so lets begin. take 3 cups all purpose flour and 1 teaspoon salt. if you want you can sift flour and salt together. then mix very well. keep aside. take 250 grams cold unsalted butter and chop it in 1 inch cubes . overall you will need 2 cups chopped butter. do note the butter has to be cold and hard. it should not be soft. now add the cold butter cubes to the flour + salt mixture. with a knife roughly cut the butter in the flour. some large pieces or cubes of butter should be there. do not make to a breadcrumb consistency. the butter should not melt. if the butter begins to melt, then cover and place in the refrigerator for 30 mins. then sprinkle ¼ cup + 1 tablespoon ice cold water all over. the water also has to be cold. so do chill water in the fridge before preparing the pastry. mix with your hands and gently bring the dough together. 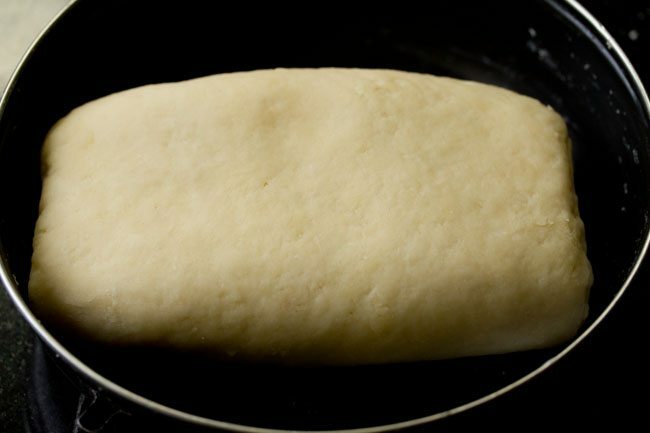 add 1 or 2 tablespoons more water if required to bind the dough or if the mixture looks very dry. do not knead. you just need to collect and gather the dough. there will be some pieces of butter in the flour and its fine. when you get a rough piece of dough together, then cover and place in the same bowl or another bowl. refrigerate for 45 minutes to an hour. 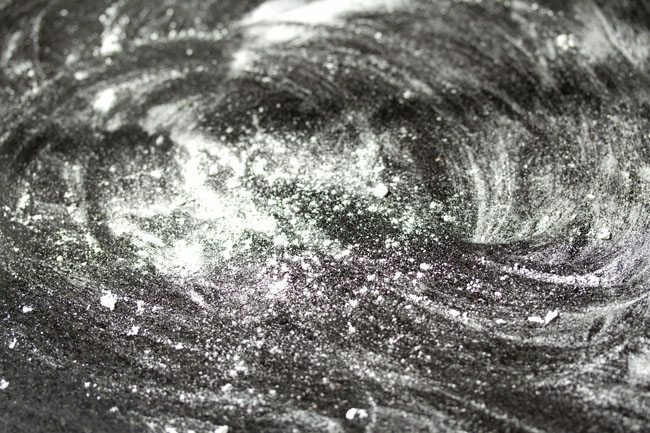 after 45 minutes, sprinkle some flour on your work surface. 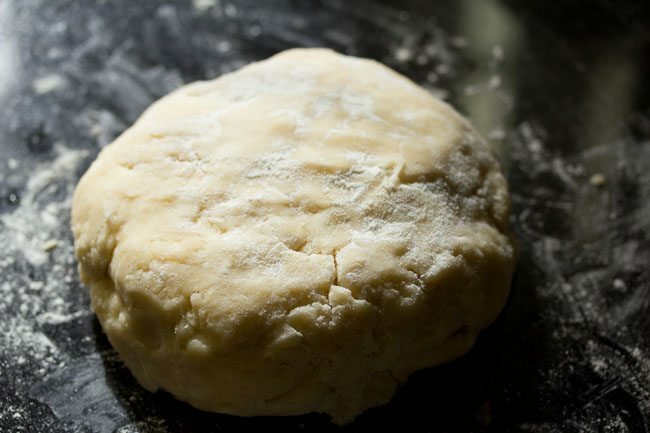 remove the rough dough from the fridge and place it on the sprinkled work surface. sprinkle some flour on the dough also. now gently roll the dough in one stroke downward. 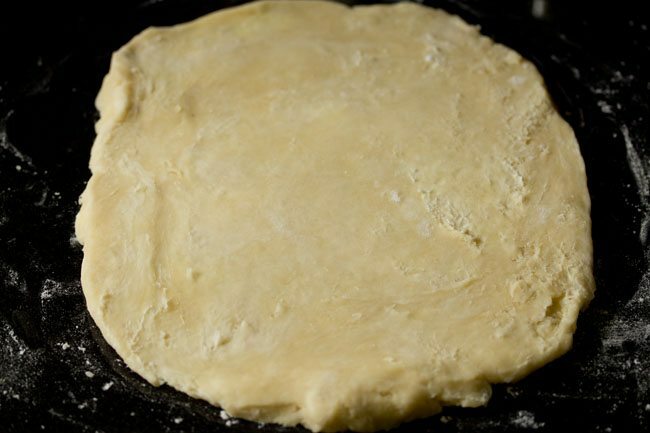 if any piece of dough comes out, then stick it back to the dough. make a 20 inches by 8 inches rectangle. shape the sides to get a rectangle with the rolling pin. now make two folds. first fold from the top and bring the fold till center. overlap the second fold on top of the first fold. 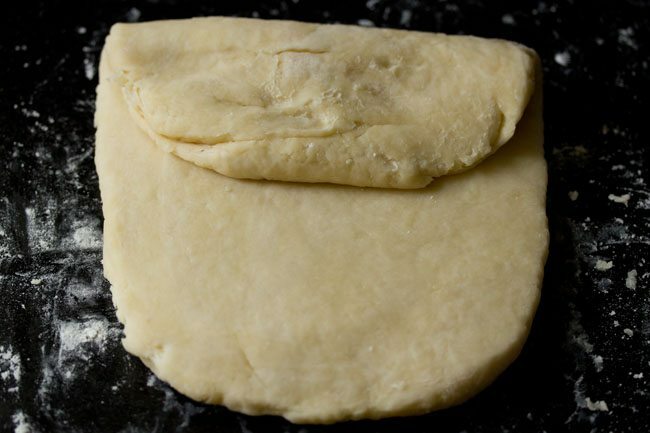 now lift the folded dough and place the overlapped folded side facing your left hand side. the dough will be facing lengthwise to you. 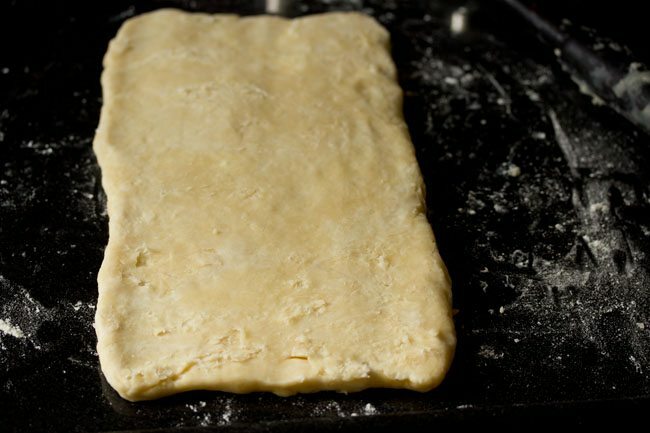 again sprinkle some flour and gently roll in one stroke to make a rectangle. again fold and keep the folded side facing your left hand side and gently roll. repeat this folding and rolling 6 times. after the last rolling is over, then fold again. then gently roll a bit to even the dough. you will see this last fold is much more smooth than the previous ones. 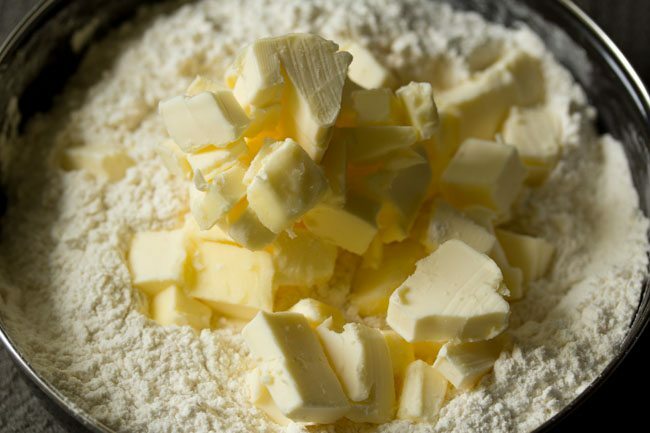 do note that if the butter begins to melt, then refrigerate the dough for 20 minutes after every fold. cover the dough and keep in the fridge. in hot and warm temperatures you may need to do this. 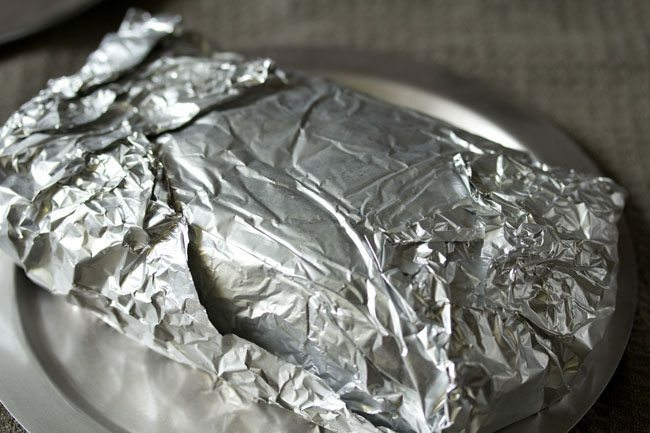 cover with a foil or cling film and place in the fridge for an hour before you start shaping and making the pastries. you can also keep overnight or for a day. if not using the dough in a day, then keep in the freezer. 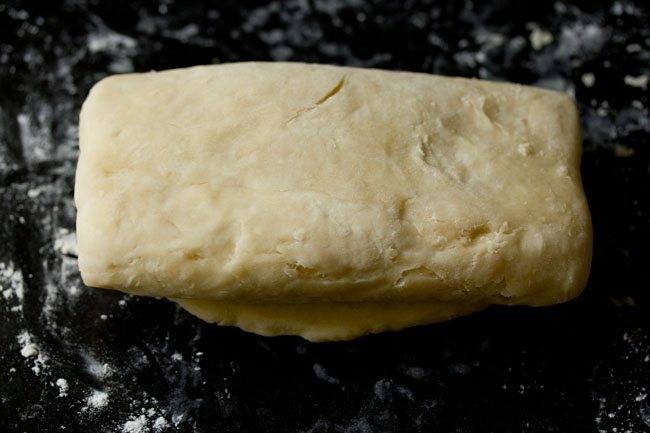 use puff pastry dough to make your favorite recipes with it. 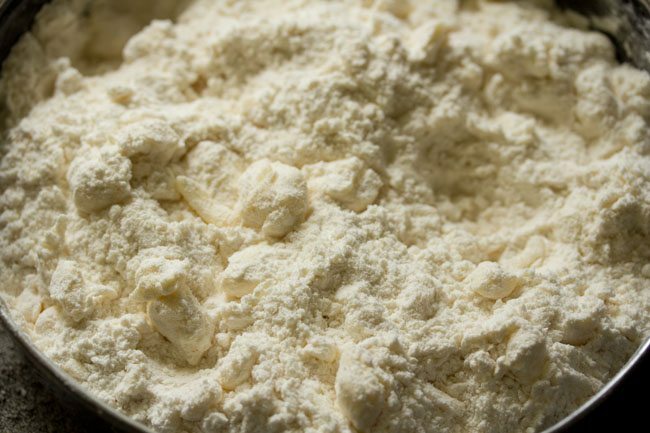 1. take 3 cups all purpose flour and 1 teaspoon salt in a large bowl/pan or on your work surface. if you want, you can sift flour and salt together. 2. then mix very well. keep aside. 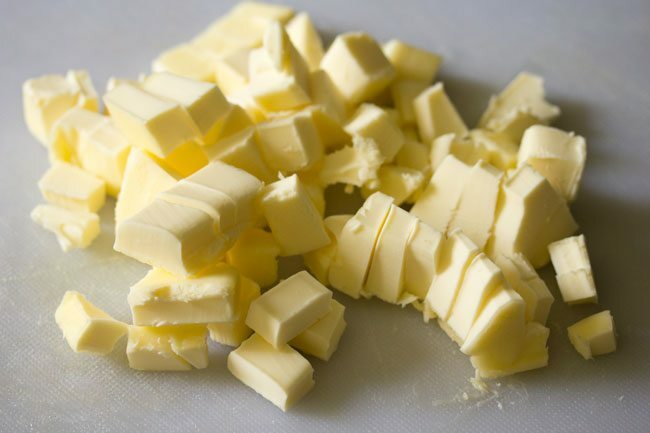 3. take 250 grams cold unsalted butter and chop it in 1 inch cubes. overall you will need 2 cups chopped butter. do note the butter has to be cold and hard. it should not be soft. 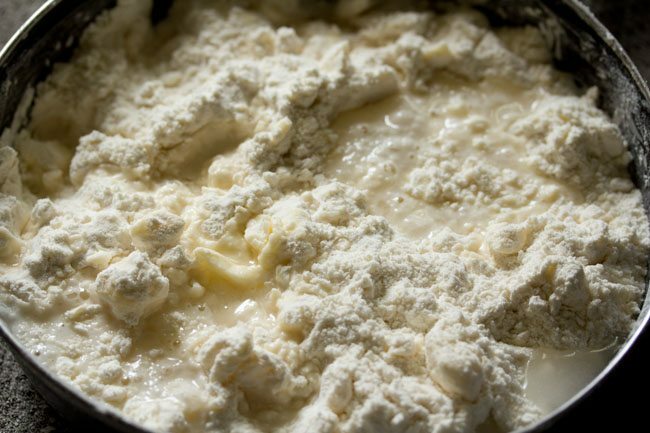 4. now add the cold butter cubes to the flour + salt mixture. 5. with a knife roughly cut the butter in the flour. 6. some large pieces or cubes of butter should be there. do not make to a breadcrumb consistency. the butter should not melt. if the butter begins to melt, then cover and place in the refrigerator for 30 mins. 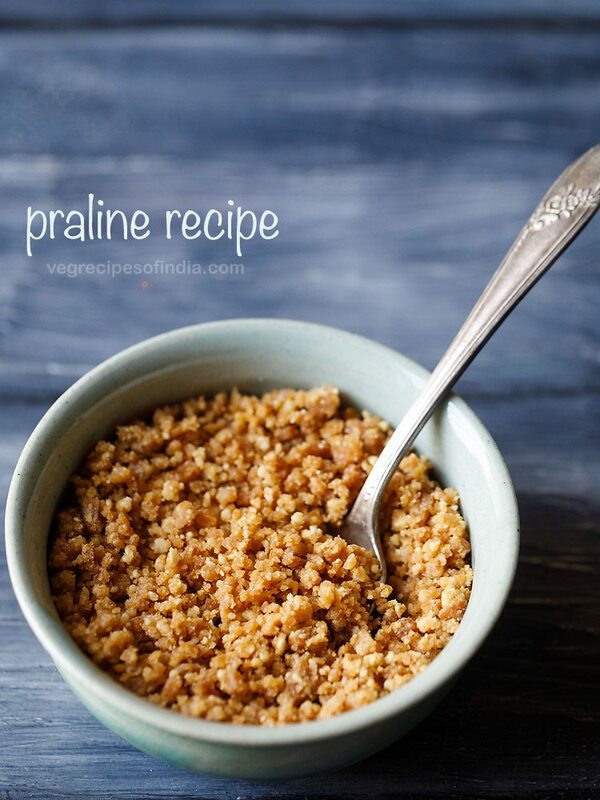 7. then sprinkle ¼ cup + 1 tablespoon ice cold water all over. the water also has to be very cold. so do chill water in the freezer before preparing the pastry. 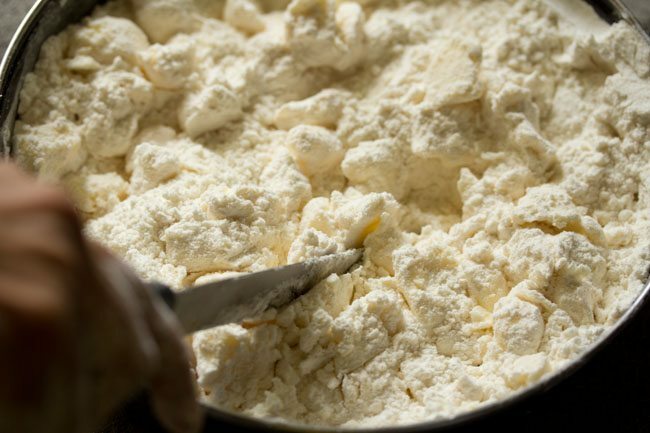 8. mix with your hands and gently bring the dough together. 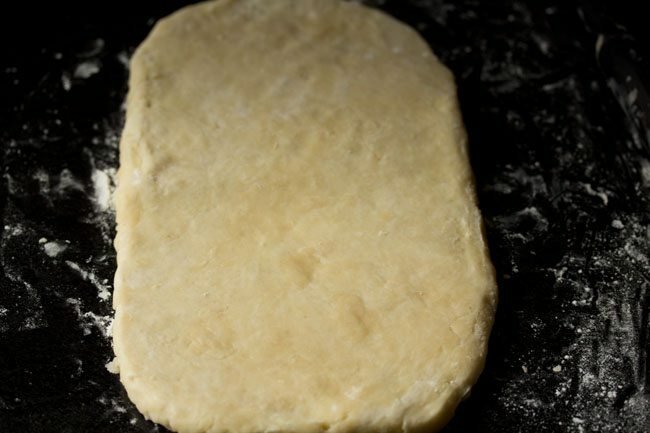 add 1 or 2 tablespoons more water if required to bind the dough or if the mixture looks very dry. do not knead. you just need to collect and gather the dough. there will be some pieces of butter in the flour and its fine. in case the dough becomes moist or sticky, then add a few tablespoons of flour. 9. when you get a rough piece of dough together, then cover with a lid and place in the same bowl or another bowl. 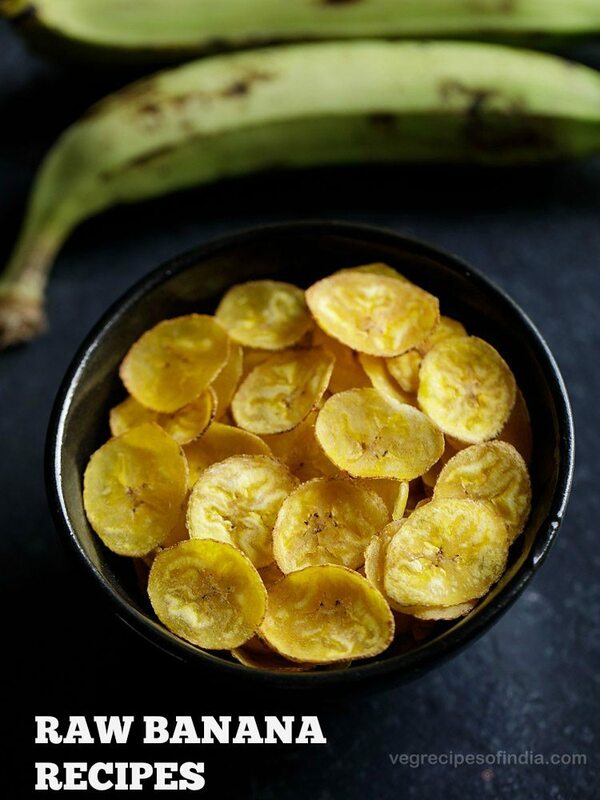 refrigerate for 45 minutes to an hour. 10. after 45 minutes, sprinkle some flour on your work surface. 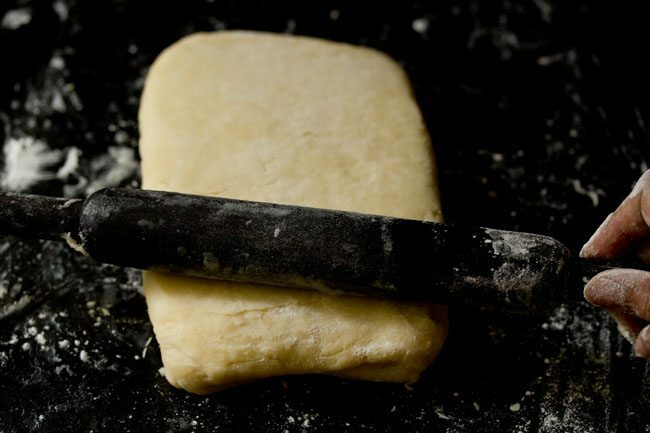 11. later remove the rough dough from the fridge and place it on the sprinkled work surface. 12. sprinkle some flour on the dough also. now gently roll the dough in one stroke downward. if any piece of dough comes out, then stick it back to the dough. 13. make a 20 inches by 8 cm rectangle shape. with the rolling pin, even the edges to get a rectangle like shape. 14. now make two fold. first fold from top and bring the fold till center. 15. overlap the second fold on top of the first fold. if you see, the pastry dough looks jagged and not even. 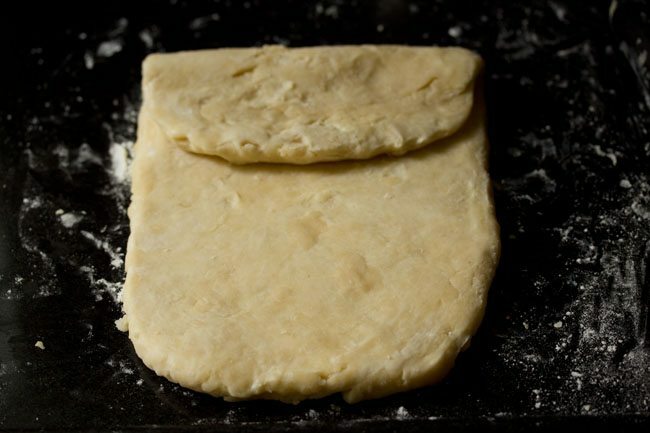 16. now lift the folded dough and place the overlapped folded side facing your left hand side. the dough will be facing lengthwise to you. 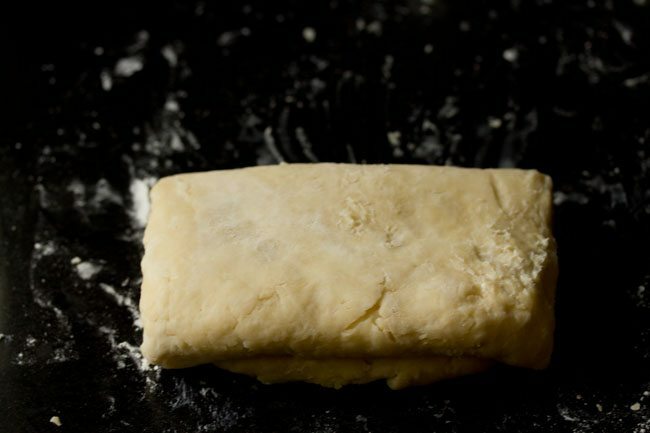 17. again sprinkle some flour and gently roll in one stroke to make a rectangle. 18. again fold. here the pic is with the fold downwards. 19. again keep the overlapped folded side facing your left hand side and gently roll. sprinkle some flour if required. 21. here is a pic of the folded dough. this is the third time i was folding. just to show you the dough texture. 22. lift and change the position. sprinkle flour and roll again. 23. here is the folded dough the 4th time. you will see the dough has become much more smoother. 24. again roll and then fold. i did this rolling and folding for 6 times. so the rolling and folding has to be done for 6 to 7 times. 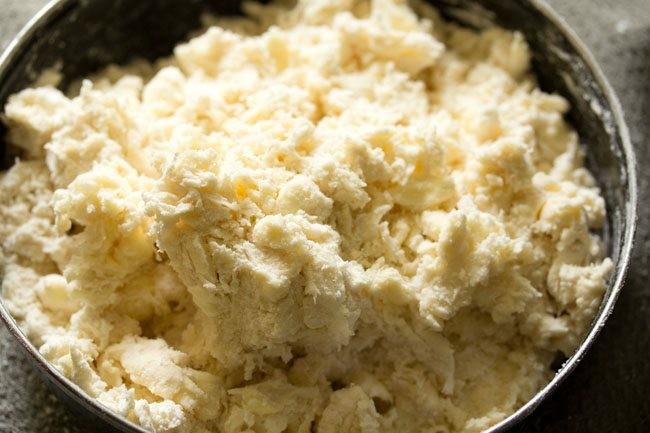 if the butter begins to melt, then refrigerate the dough for 20 minutes after every fold. cover the dough and keep in the fridge. in hot and warm temperatures you may need to do this. 25. this is the fifth fold. again roll and fold. 26. once the last folding is done, then gently roll a bit to even the dough. you will see this last fold is much more smooth than the previous ones. 27. cover with a foil or cling film and place in the fridge for an hour before you start shaping and making the pastries. you can also keep overnight or for a day. if not using the dough in a day, then keep in the freezer. the dough should be completely covered, otherwise it will dry out in the fridge. 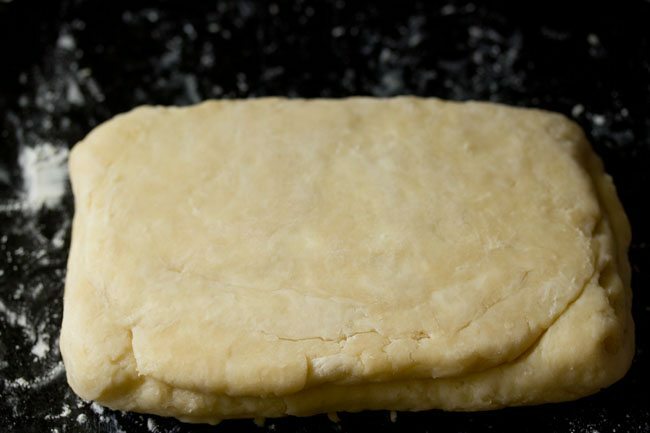 if refrigerated – then remove the pastry and keep at room temperature for 5 to 10 minutes. 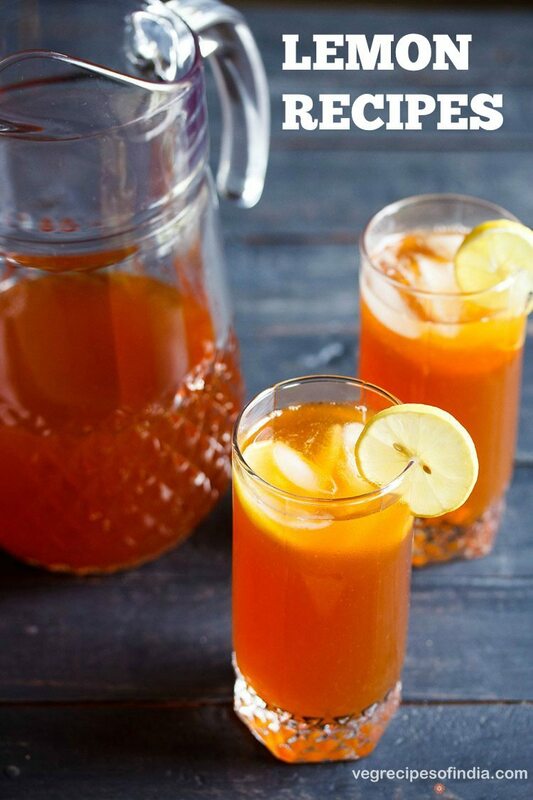 if freezed – them remove and keep at room temperature for 20 to 30 minutes. 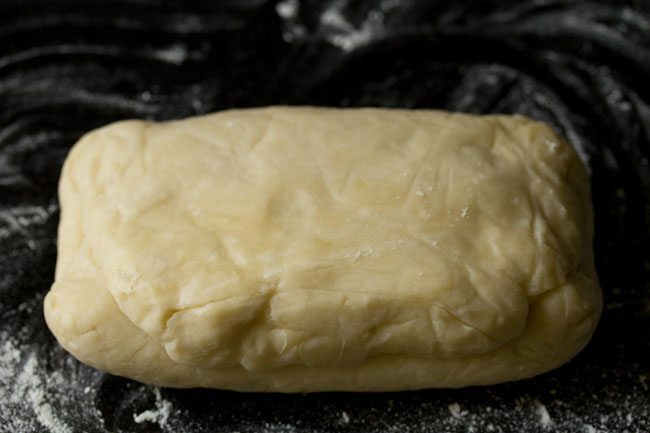 if not stuffing or filling the pastry with anything, then you can directly shape and bake without thawing/defrosting. 27. sprinkle flour and then very lightly and just a bit, roll the dough. just to make the surface even. then slice the dough in two or three equal parts. this depends on the quantity of puff pastries you want to make. then roll and make puff pastries with your choice of fillings. do note that the filling has to be ready, before you roll and then stuff it in the puff pastry sheets. this recipe gives you about 900 grams (about 2 lb) of puff pastry dough. you can use the puff pastry the way you want to make any baked snacks. Hi i am using microwave convection oven. It has microwave,grill,convection, combination as its mode. Which mode am i supposed to used for making puffs. Gvv, only use the convection mode. don’t use combination mode or microwave mode or grill mode. The butter started melting while rolling and I had to literally keep it in the fridge after each roll. So ended up doing traditional way ?One doubt I have is in this case whether traditional method is better because we are keeping 1 rectangular butter piece in the middle and rolling. So will it help in reducing melting? 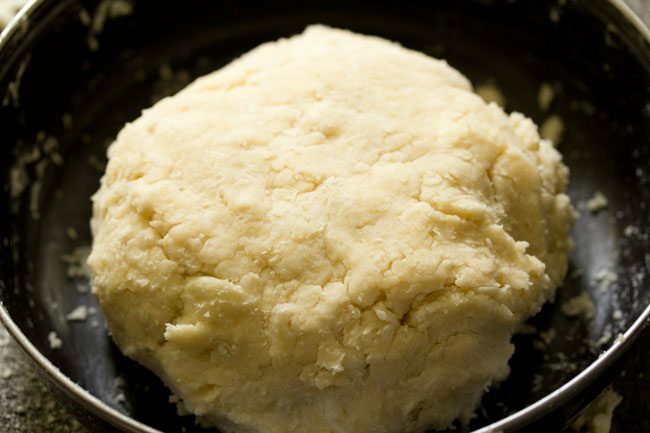 The method used here has large amounts of butter cubes in the dough. Also I have seen some videos where melted butter is used and a tsp of it is spread after each roll. remya, in warmer or hotter days, the butter does melt. in traditional method also butter melts. while living in goa, where it is more hot, the butter would melt always. i tried three to four times with the traditional method and then gave up. even i have seen some recipes where melted butter is used. but i do not know how the texture will be. you can chop the butter cubes to slightly smaller cubes and then add to the flour. Thanks for the reply. Will try and let you know ? welcome remya. sure do let me know. but next time i made it thick as 1cm and kept it cold to oven and yesss it turned out so good and the layered opened up. yes mahsa, the pastry sheet has to thick when adding the filling, otherwise they do not puff. the sheets have to be cold when stuffing is added as that helps them to puff well when baking. good to know that second time the results were good and you did the right thing. thanks mahsa. will update the preparing time. 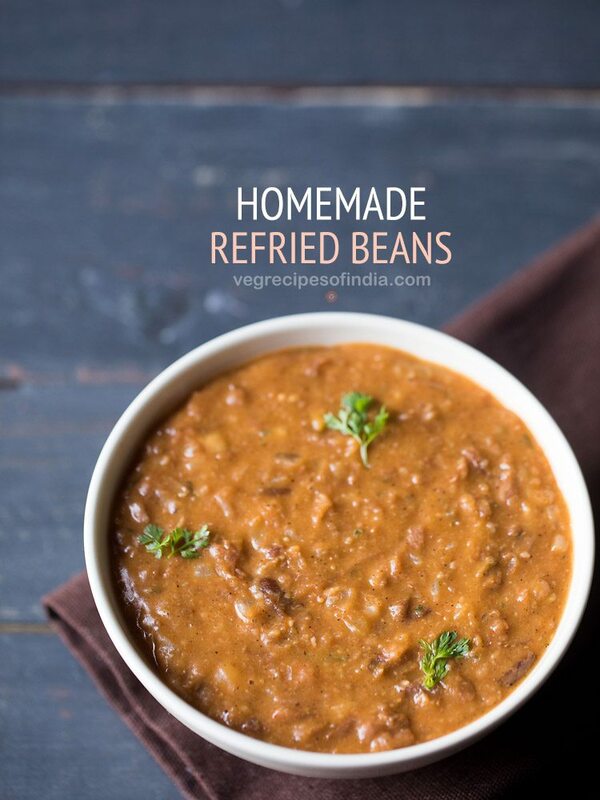 How many days can it b kept on freezer…..van the recipe b halved? yes recipe can be halved. keeps good for 1 to 2 months. its our pleasure shona, thanks for positive views. 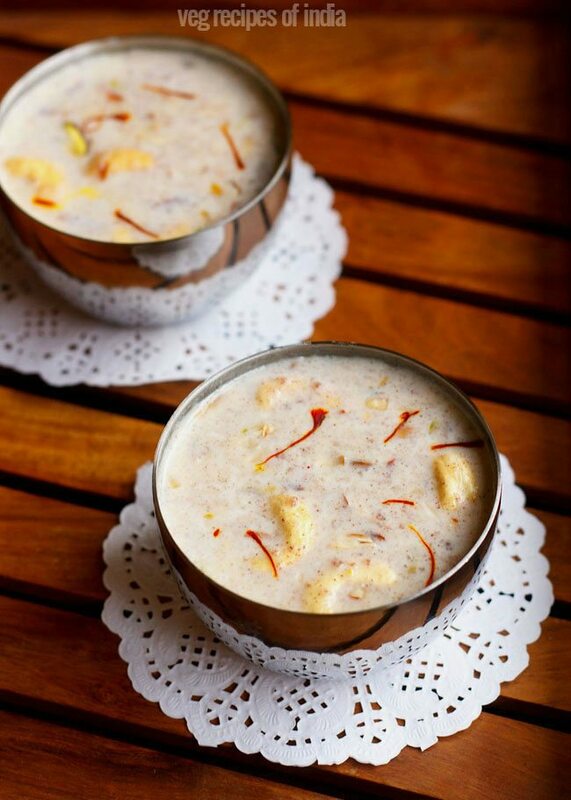 you can use ghee. but with ghee the aroma changes. though i think it will still taste good. but don’t use dalda or vanaspati as they are hydrogenated fats and not good for the heart. can i use whole wheat flour instead of all purpose flour?? i tried twice with whole wheat flour and crust did not come out good when baked. its dense and moreover there is no lightness. so i would suggest to use all purpose flour. but you can give a try with half-half of both whole wheat flour and all purpose flour. 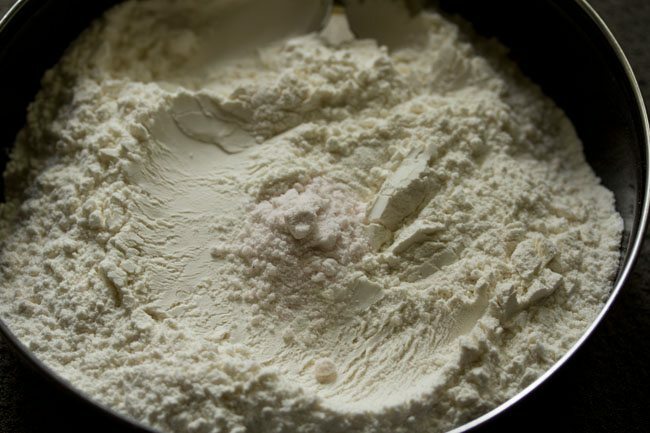 if using whole wheat flour, then some more water will be required to bind the dough. you can use any brand of salted butter. thanks bhawna 🙂 for your kind words. 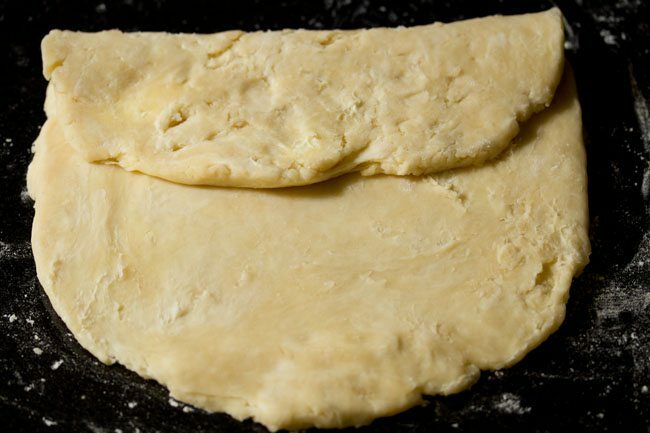 hi, shouldn’t there be more butter added to the pastry during the process of rolling? 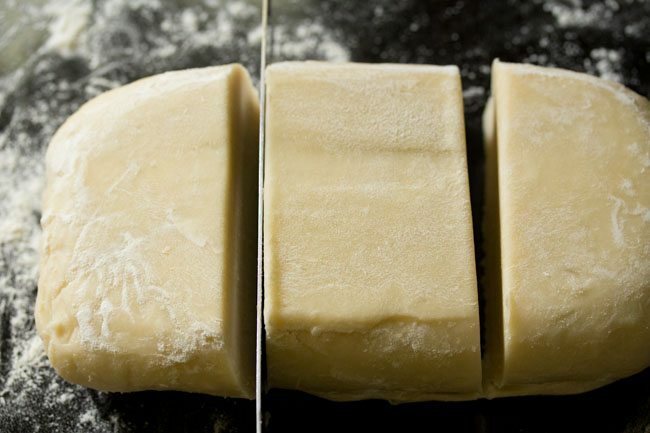 puff pastry is about putting butter between the pastry, so that it can divide and become puffy during baking. ania, the method that are you are mentioning, is the traditional method. 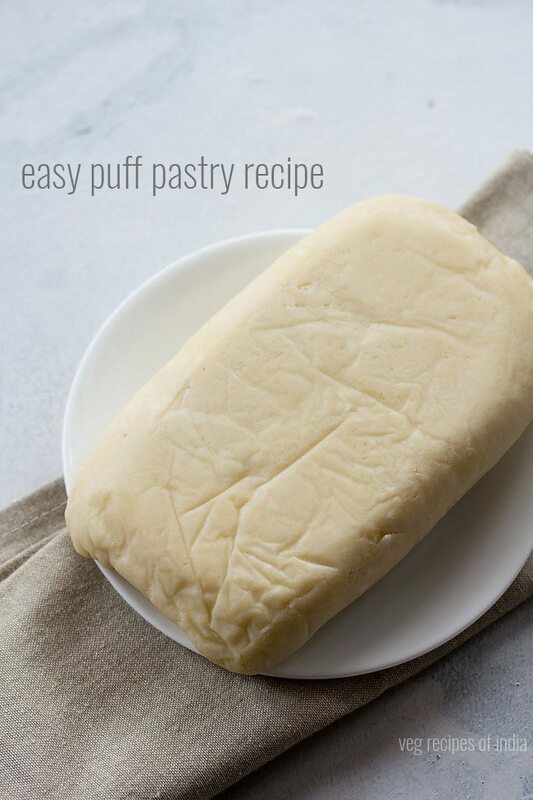 this is a quick rapid method of making puff pastry and helps homemakers who do not have much time on hand, but want to make puff pastry dough at home for their kids and family. these also get puffed up while baking but not that much as compared to the ones which are conventionally made. i will add the traditional method too in some time.